Legacy of Hope is currently in need of a sponsor! Will you help? 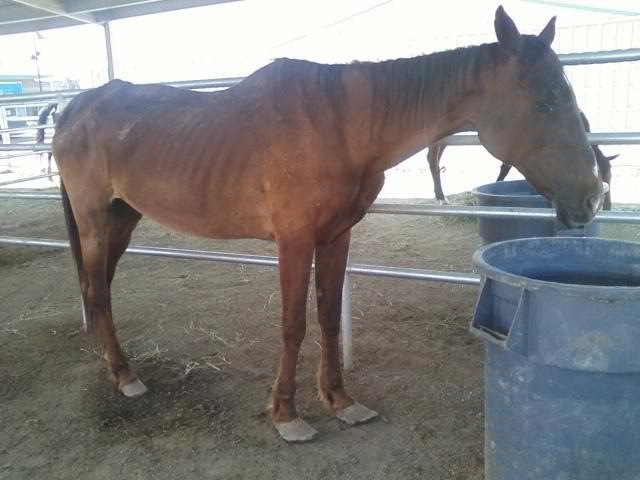 "Legacy of Hope," or as she’s affectionately known around the ranch as “Legs” (and on Facebook as “Hope”) was picked up by Animal Control when a man went out to feed his horses and found her trying to jump the fence to get to the food. 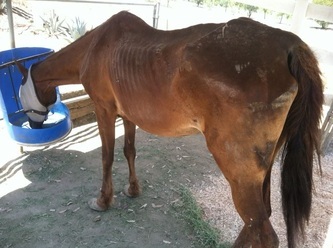 Toby’s Legacy was contacted with hopes we would take her because her rehabilitation would be extensive and the local shelter did not have the resources. 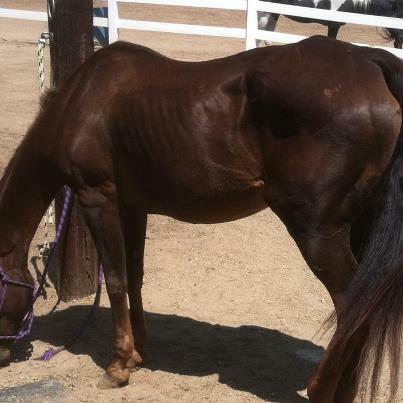 Legs is a 9-year-old chestnut Quarter Horse and is 14.2 hands. 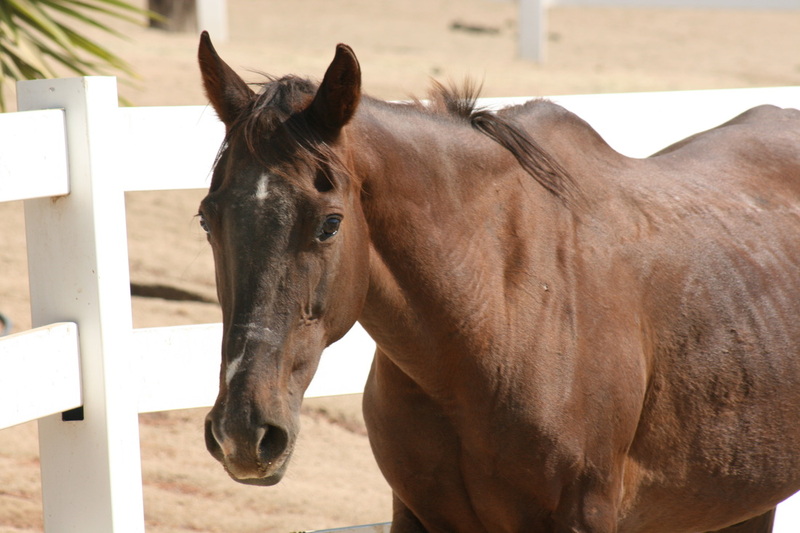 When she arrived, Legs had a body score of 1 and “hooves so overgrown that I could only describe them as elf slippers with a rocker bottom,” remembers Lisa Bone, co-founder of Toby’s Legacy. 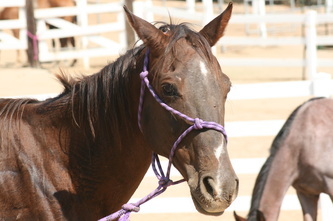 Legs had difficulty walking and there was question as to whether or not she would make it. Lisa had never seen a horse in this condition. Due to her extremely emaciated state, Legs had to be placed on the Re-feeding Syndrome program which consists of six smalls meals of alfalfa hay throughout the day. Over a 10-14 day period the number of meals is reduced and portion size increased. This program prevents organ failure in an emaciated horse when introducing food back into their life. 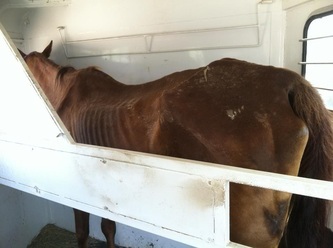 Unfortunately, horses as emaciated as Legs can literally be “killed with kindness” when a person with good intentions tries to “fatten-up” an emaciated horse too quickly. After the first two weeks, other feeds can be introduced as well. 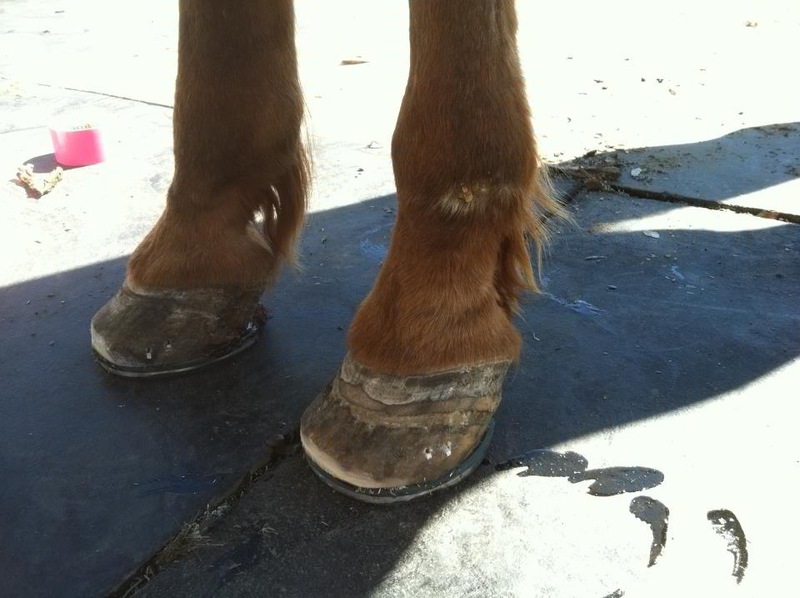 The farrier came out within a few days and was able to shorten her feet quite a bit. 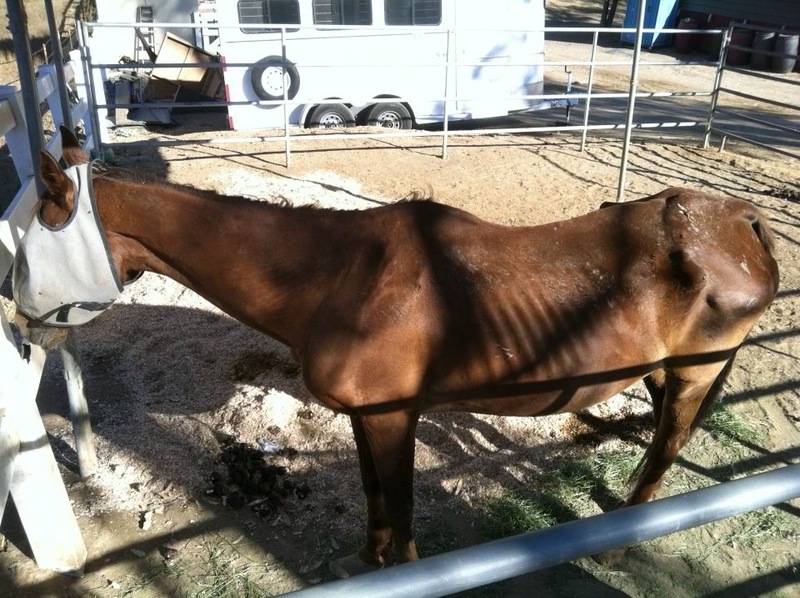 He felt her condition and hoof growth was a result of sitting in a corral, starved, standing in urine and feces. The day after her first trim Legs became extremely lame. The farrier returned to trim more toe off her feet and two abscesses were found. 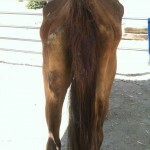 He trimmed later and another abscess was found. 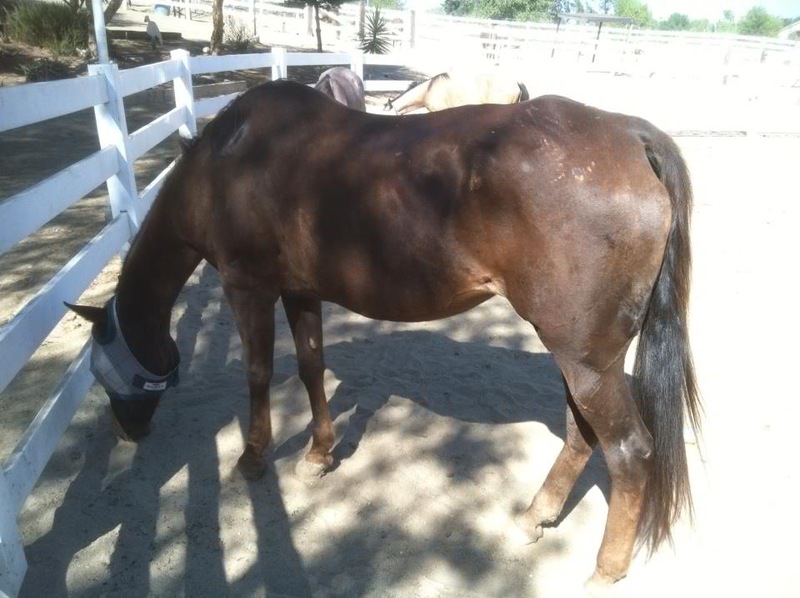 It’s the current expectation that the abscesses were contributing largely to her lameness, and they will take months to heal. At this time, the farrier and vet due not believe x-rays are needed and if she is not sound by the time the abscesses heal then x-rays will be performed to rule out founder. 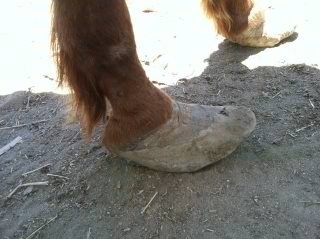 Legs currently has pads and shoes on her feet to help support the soles that had corroded with abscesses. She is not sound but comfortable and pain meds are no longer necessary. We have also noticed that her body is tender to touch. This may be a result standing in a stall for a long length of time during her neglect or soreness from the condition of her hooves placing strain on her ligaments and tendons for so long. Volunteers with Toby’s Legacy have begun stretching exercises with Legs and hope chiropractic sessions will help once they can be afforded. Legs is consistently putting on weight but it will take time. 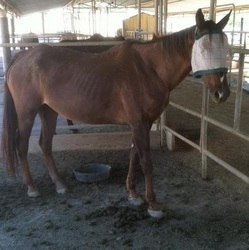 We are nothing but optimistic that she will make a full recovery. 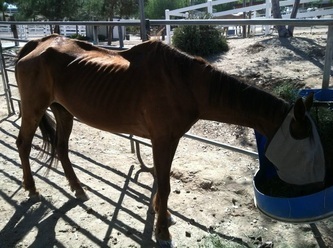 Legs is a very reserved horse although she is grumpy around food and pins her ears back. 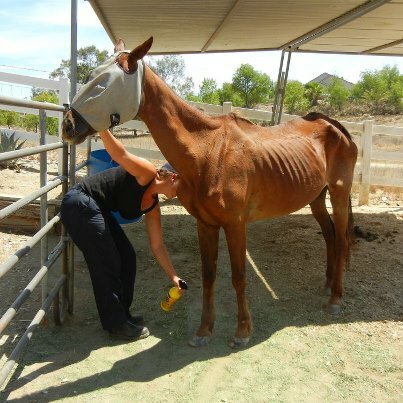 This is likely a very direct result of the starvation she experienced – we’d be protective of our food too! She is very dominant with other horses. 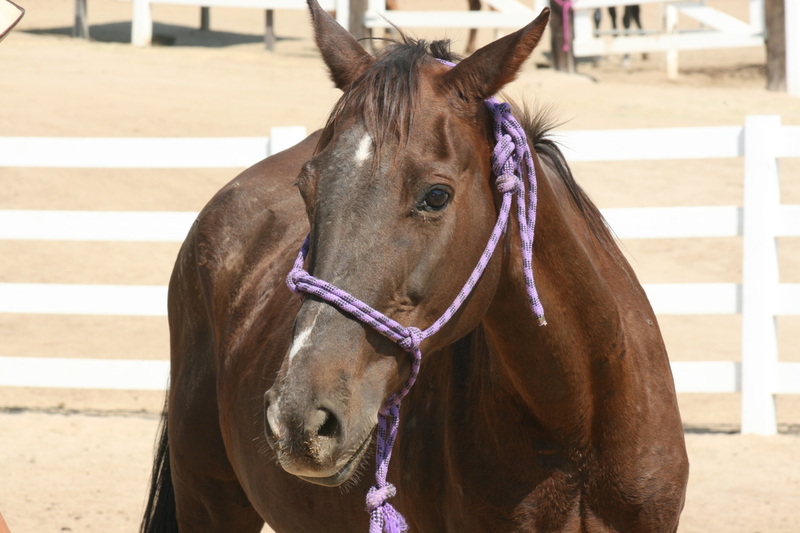 It does appear that Legs has had some training as she was a perfect angel when tacked up. 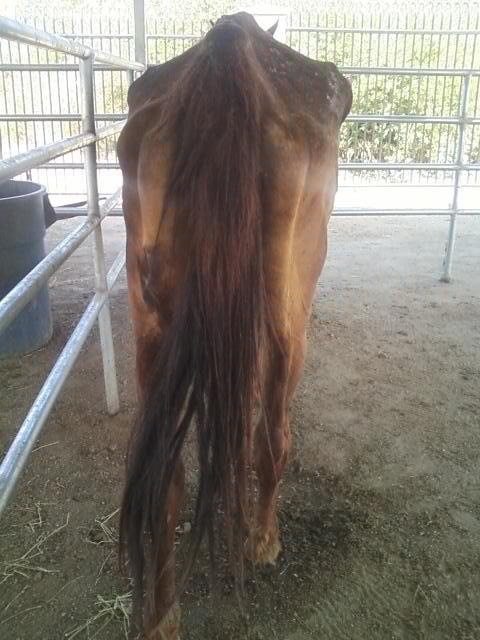 She trailers nicely, stands perfectly at the tie rail, for the farrier and for baths. Lisa would like to think at some point that someone loved Legs and took the time to teach her those things. Up until recently Legs seemed depressed and would never look directly at Lisa or come when she was called out to. 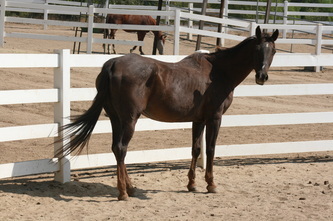 However, in recent turn-out sessions Legs sought out the attention and affections of Lisa and other visitors present several times. It wasn't much but it means a lot to the team at Toby’s Legacy... and obviously the love and care she’s receiving means a lot to Legs. Legs will not be a cheap or quick rehabilitation. It will take time for her to put on weight; she needs special shoes and will likely need some chiropractic care to help her make a full recovery. 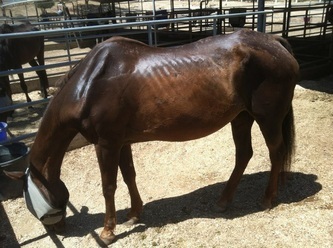 Toby’s Legacy is committed to helping this sweet girl make a full recovery – both physically and emotionally – as she heals and learns to trust again, but unless met by an individual or corporate sponsor the extra expenses for her care will take away from our ability to rescue another horse in need. Will you consider playing a critical role in Legacy of Hope's second chance by becoming her sponsor? Thank you in advance for considering this important role! 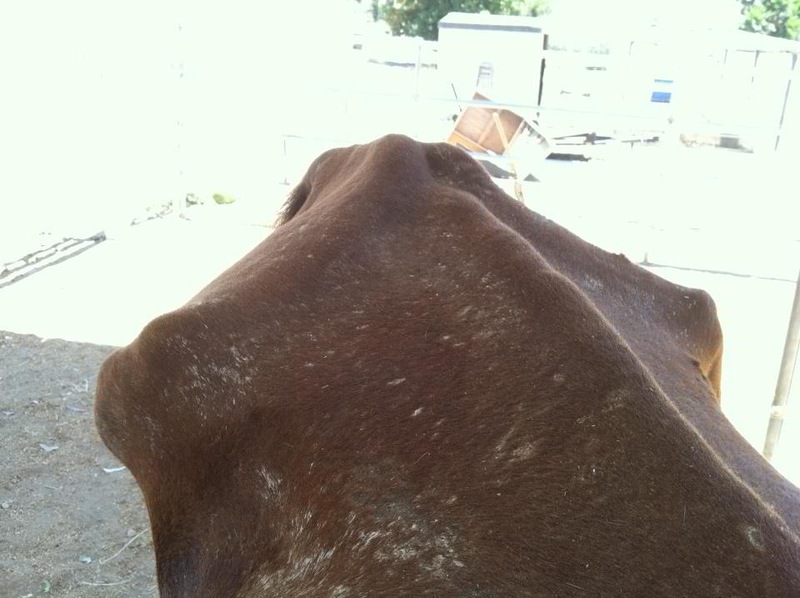 UPDATE: We have tried everything under the sun to treat Leg's front laminitic hooves. We recently purchased Easyboots with Soft Ride orthotics. She loved them and was almost 100% sound. Well, the boots rubbed sores on her heels and we are back to barefoot. the wonderful news is, she is doing wonderfully barefoot! She is not sound but pretty darn comfortable. 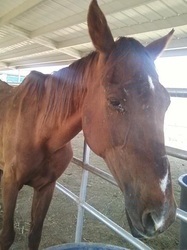 UPDATE 8/22/14: We had Dr. Moss out to X-ray leg's feet. We wanted to know if we were missing something. Her X-rays revealed further deterioration in her coffin bones. Sadly, the many years of neglect she endured has caused damage that is, not only irreversible, but will continue to worsen. The plan, now, is to place Legs in sanctuary. She will stay with us forever. There is no fixing her feet, but we will keep her as comfortable as we can for as long as we can. More Photos of Legacy of Hope: From Rescue to Now..
(C) Toby's Legacy Equine Rescue 2012. All Rights Reserved.